No work in progress this week, as I spent the weekend at Glasgow Comic Con then had to do much more boring things the rest of the week. P Last year was the first year I went to this comic con and I enjoyed myself tremendously, talked to loads of people (friends and strangers), drank wine, and bought comics. So this year I did it all again, only with a mission to spend some money, get some new inspiration as well as previous favourites. From the bottom up, I got (for free) Alan Grant and Ed Brubaker and Sean Phillips's Criminal: The Last of the Innocent - I got a drawing from Sean which is lovely, and it was fascinating to watch him do it - both similar and different from what I do. Looking at his webpage he does paintings as well as illustrations/comics - there is a blog, which looks fascinating (a few entries down is his reference/art books - what's not to love about that?). If I like this one, I suspect I'll soon be gathering all the rest of his work. IDP 2043 is a collaborative effort overseen by Denise Mina whom I saw talking about the book with http://hannahberry.co.uk/ at last year's comic con so it was lovely to pick up a copy. It seems to be stuffed full of good writers and artists so should be a treat. Collaboration also produced Who On Earth Was Thaddeus Mist which is described as a visionary gothic novel and looks beautiful. Both books were from stands held by the publisher's rather than the authors/artists it's nice to see them making the effort. Accent Comics in particular had a lot of very, very tempting books so choosing one was difficult - but I just had to go with the victorian gothic vibe, since that's close to my heart at the moment. Saga 4 by Brian Vaughan and Fiona Staples was on my to-buy list, having already got volumes 1-3. And my, they are beautiful - so much so that my friend Fiona was oohing over the book, asking me where she could but the comic with the legless person and tv headed baby. The answer was the Forbidden Planet stall and I was really impressed by the range of titles they had - I have always rather put them down as being very TV and film based. Maybe I'll actually wander in to their store the next time I'm in town. Tillie Walden's The End Of Summer also comes from a publisher's page and was pretty much chosen becasue it looks beautiful and had a cat on the front cover. Avery Hill Publishing told me it's a first book by a 19 year old, so maybe I'm supporting the next big talent - who knows? Clare Forrest's Mighty Women Of Science had me sold just at the title - never mind she is a charming illustrator. She was also helping run the drawing room up in the CCA so unfortunately I didn't really get to chat with her much as she was really busy helping all the kids - but most definitely one to look out for in the future. Dungeon Fun issues 3 and 4 are lying on the top of the pile and were also on my to-buy list - since I missed the party for issue 4 last Thursday. Issues 1 and 2 were random buys for me last year and were utterly charming, so I'm going to re-read them and then finish the tale. Neil Slorance is the illustrator and Colin Bell the writer - both are local lads and £16 for all four copies seems a real steal to me, for the amount of pleasure I'm going to get from these comics. Tim Bird's Grey Area From The City to The Sea is another impulse purchase from Avery Hill Publishing - it just looks so elegant. 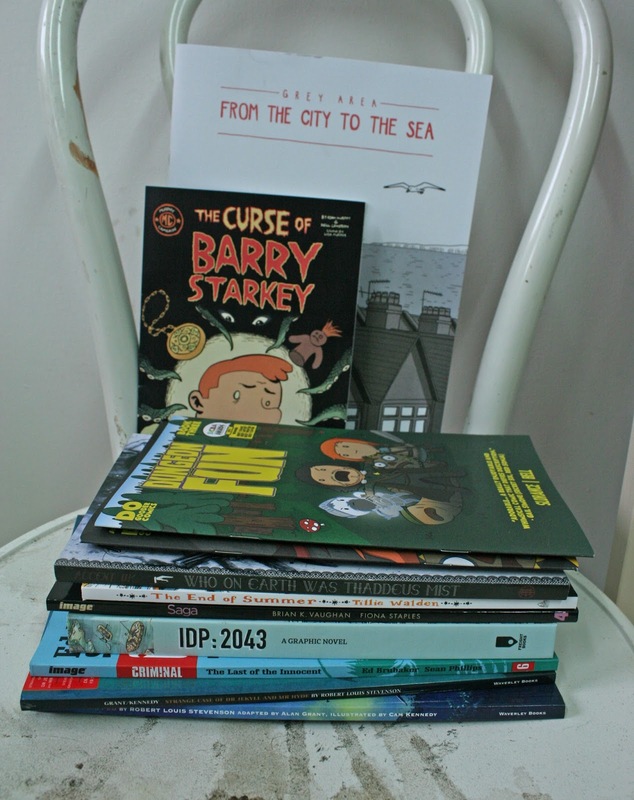 Lastly is The Curse of Barry Starkey by Neill Cameron and Adam Murphy . Adam's Corpse Talk was one of the hits of last years show - so much so, he had sold out on the first day. Because of this he was offering a drawing to everyone who ordered a book - I got mine of Alice Liddel and was very pleased when it was delivered suprisingly promptly. There will be a Cropse Talk 2, but not for another few months sadly. So, that's my round up. What did you get, what would you recommend? WIP 2nd July 2015 - a day late, sorry guys!